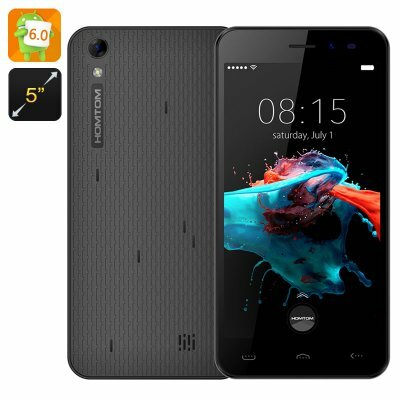 Successfully Added HK Warehouse HOMTOM HT16 Smartphone - Android 6.0, 3G, 5 Inch HD Screen, Hot Knot, MTK6580 Quad Core CPU (Black) to your Shopping Cart. The HOMTOM H16 is equipped with the smooth and powerful Android 6.0 operating system, bringing along numerous of the latest advanced features for optimizing your phone’s performance, lowering up to 20% of power consumption, and providing a better and smoother experience in general while enjoying all your favorite apps, movies, games, and more. The smartphone’s powerful operating system combined with its great battery capacity of 3000mAh and 5 Inches HD display offers you countless possibilities. Now you can enjoy watching full HD movies or playing all your favorite games and needn’t worry about the battery on your phone. Another nice new feature is Google Now on Tap, allowing you to optimize your online search efforts by making it instant and effortless. By supporting two SIM cards in one Smartphone the HOMTOM H16 allows you to maintain a clear separation between work and private life in one device. Android 6.0 furthermore comes along with useful new security measures, VPNs, and access and storage options through which your HOMTOM H16 and all personal files are guaranteed to be protected at all times. The HOMTOM HT16 Smartphone comes with a 12 months warranty, brought to you by the leader in electronic devices as well as wholesale Android Phones..